Are you tired all the time even after getting a full night’s sleep? Do you find yourself forgetting where your keys are or where you parked your car? Or perhaps you’re dealing with cold hands, hair loss, weight gain or difficulty losing weight, mood swings, depression, or anxiety, constipation, or hormonal imbalances? 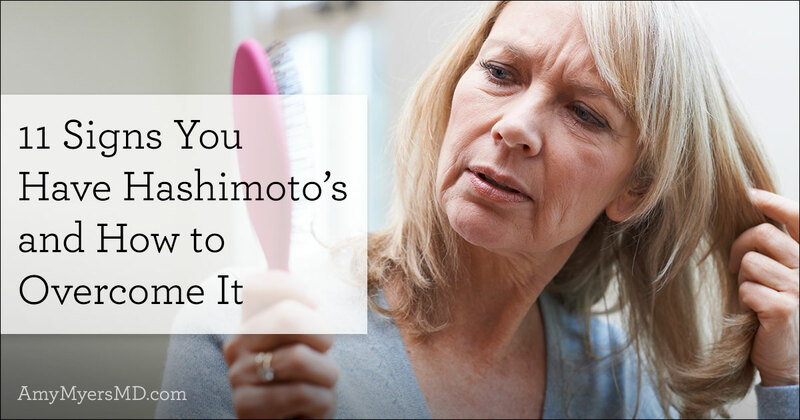 If any of that sounds familiar, you could have Hashimoto’s, which is an autoimmune condition of your thyroid. This can lead to a whole host of symptoms because your thyroid is your body’s engine. It produces hormones that attach to every cell in your body, and it regulates all of your metabolic functions, from heart rate to temperature to metabolism to your mood. Hashimoto’s is incredibly common and I have helped thousands of patients in my clinic overcome Hashimoto’s. The GOOD news is that by addressing the root causes that lead your immune system to attack your thyroid in the first place, you can REVERSE your condition and eliminate your symptoms! So let’s cover what Hashimoto’s is, common symptoms it causes, why your doctor may have missed your diagnosis, and how to overcome it! Despite what your conventional doctor said, Hashimoto’s isn’t actually a problem of your thyroid it’s a problem of the immune system. Remember, Hashimoto’s occurs as a result of a malfunctioning immune system (not a problem with your thyroid), if you tackle the underlying issues that caused your immune system to go rogue in the first place, you can stop its attack on your thyroid, restore optimal function, and eliminate your symptoms! Through my research and a decade of clinical experience, I have identified 5 environmental root causes of Hashimoto’s. 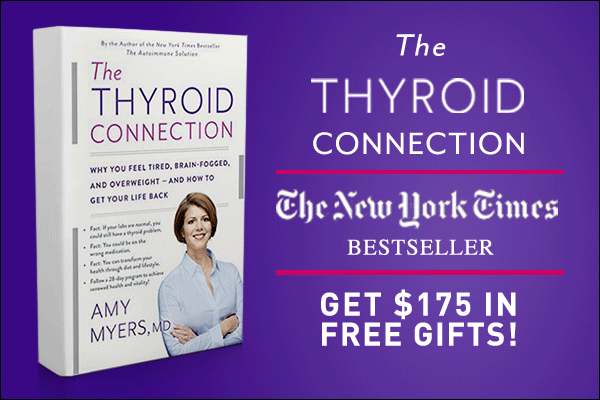 In my book, The Thyroid Connection I walk you through all five, explain how to overcome them, and provide a step-by-step, 28-day plan to put it all into action. Here I’ll cover the basics. If you have Hashimoto’s, or any autoimmune condition, repairing your gut is vital to reversing your symptoms. After all, nearly 60-80% of your entire immune system is located in your digestive tract. We now know from the word of Dr. Alessio Fasano from Harvard that leaky gut, which occurs when your gut lining becomes too permeable, is one of the necessary precursors for autoimmunity, including Hashimoto’s. If your gut is leaky, toxins, microbes, viruses, bacteria, and partially digested food particles are able to escape via your bloodstream. Once escaped, they trigger an attack from your immune system, leading it to become overstressed until it eventually attacks your thyroid by mistake. To make matters worse, gluten has a very similar protein structure to your thyroid, so similar in fact that your immune system thinks they are one and the same. So every time you eat gluten your gut remains leaky and gluten particles escape, which your immune system attacks, catching your thyroid in its crosshairs in the process. This is a phenomenon called molecular mimicry, or more simply, a case of mistaken identity. Dairy is the second biggest culprit for Hashimoto’s and other autoimmune conditions because casein, the protein found in dairy, is also very similar to gluten, and causes this same molecular mimicry reaction. For these reasons, I recommend that all Hashimoto’s patients eliminate gluten and dairy for good. However, it’s not only about removing the harmful foods, part of the process is adding in delicious foods packed with the nutrients your thyroid needs! 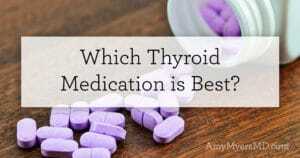 Two of the most important are iodine (a building block of thyroid hormone) and selenium (helps convert thyroid hormones to their active state and reduces Hashimoto’s antibodies). Eating a diet rich in clean, whole foods will go a long way in boosting your levels of these critical nutrients. However, due to our modern lifestyles, I recommend taking a high-quality multivitamin that includes these nutrients in order to maintain sufficient levels. I custom formulated a multivitamin that is specially designed for patients with Hashimoto’s and contains optimal daily levels of iodine, selenium, and other key nutrients for optimal thyroid function. Mercury, perchlorates, and nitrates are all toxins that are chemically similar to iodine (which your thyroid uses to produce its hormones) and are quickly absorbed by your thyroid in place of iodine. When this occurs, your thyroid doesn’t have enough iodine to produce adequate levels of its hormones, perpetuating Hashimoto’s symptoms. Additionally nitrates have been linked to increased rates of thyroid cancer. The good news is this – you can take steps to prevent your exposure to these toxins and to remove them from your body. First you need to know how you’re being exposed. All three of these toxins can be present in your tap water. And mercury can also be found in the air (from coal burning plants), as well as pesticides, fish, cosmetics, dental fillings, and vaccines. Then you’ll want to minimize your exposure by filtering your water and air, choosing organic food and low-mercury fish, buying non-toxic body products, having a biological dentist safely remove amalgam fillings, and making informed decisions about vaccines. From there you can focus on supporting your detox pathways so you can safely flush toxins from your body. I explain more on that in this post. There are a number of infections associated with autoimmune diseases, and there are five specifically often found in people with Hashimoto’s. These include: herpes viruses, Epstein-Barr, Hepatitis C, Helicobacter pylori, and Yersinia enterocolitica. These are common infections and often show no symptoms, so you might never know you’ve been infected. These viruses and bacteria can all be tested for and treated. 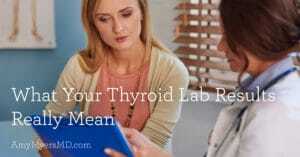 When I work with patients in my clinic to treat infections, we are able to bring their thyroid antibodies down. You can read more about what causes infections, how to test for them, and treat them in this blog post. The hormones released by your body when you are stressed slow down your thyroid hormone production, reduce your ability to convert your thyroid hormones to their active state, and bind up the thyroid hormone in your bloodstream so it can’t enter into your cells and do its job. While most of us can’t eliminate stress entirely (I know I certainly can’t! ), the key is to relieve your stress to minimize its impact on your health. Everyone relieves stress differently, so I encourage you to find what works for you, whether it’s going on walks in nature, meditating, yoga, journaling, taking a relaxing bath, or any other stress-relieving activity. If you’re ready to take back your health and overcome Hashimoto’s, pick up a copy of The Thyroid Connection to discover how to work with your doctor on the right lab testing and thyroid medication, and for a step-by-step 28-day plan (including a meal plan with recipes!) to put the five steps above into practice! When you purchase your copy, head over to this page and enter your receipt number to receive $175 in FREE bonus resources to jumpstart your thyroid! 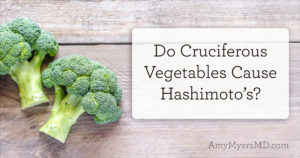 Do Cruciferous Vegetables Cause Hashimoto’s? Why Am I So Irritable and Moody? !